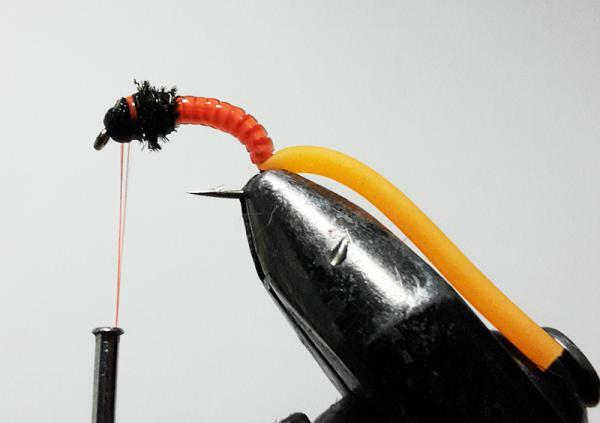 Place a #10 scud hook with a black or hot orange tungsten bead on it in the vice and wrap hot orange thread to the bend of the hook. Tie in a strand of clear vinyl cord (or red for the red version of this fly) at the bend of the hook (roughly in alignment with the hook eye) and wrap the thread to the bead (to form an evenly shaped body, ensure that the vinyl cord is wrapped with thread all the way to the bead before cutting off the excess). Alternatively, tie in two strands of stripped peacock herl, one normal strand of peacock herl, a natural cdc feather (strip the fibres off one side of the feather) and a strand of crystal flash – these materials should be twisted into a noodle to shape the body, instead of the standard vinyl ribbed body. Tie in the orange rubber ‘squirmy wormy’ just behind the bead with a few wraps of thread. Stretch the rubber squirmy wormy along the hook shank and trap it with the vinyl cord where it exits the layer of thread; continue wrapping the vinyl to the bead to form a ribbed body over the stretched squirmy wormy. Tie in three strands of peacock herl, twist them into a noodle and cover the exposed rubber area with Hard As Nails varnish; wrap the peacock noodle over the varnish and tie off behind the bead. The ‘tail’ of the worm should now also be cut to approx. 1.5 inches long. Tie this fly in a variety of colours (and also play with bead colour). Fish the Bloody Squirmy static or with small twitches in front of carp. 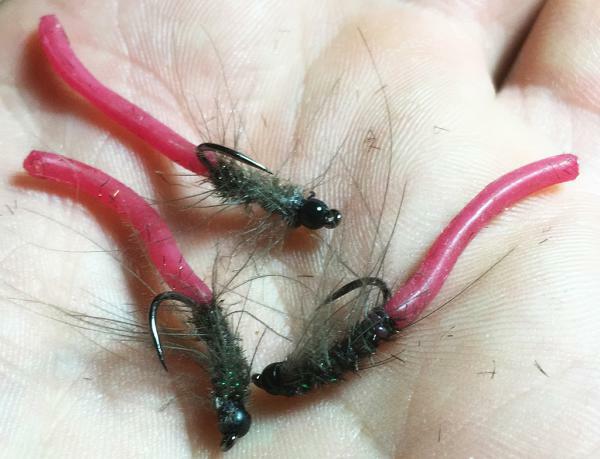 Trout and bass also take the fly as it is stripped mid water or dropped to the bottom and fished with a jigging action.